Zorro, Elegido, Pimpinela, and Nino started. 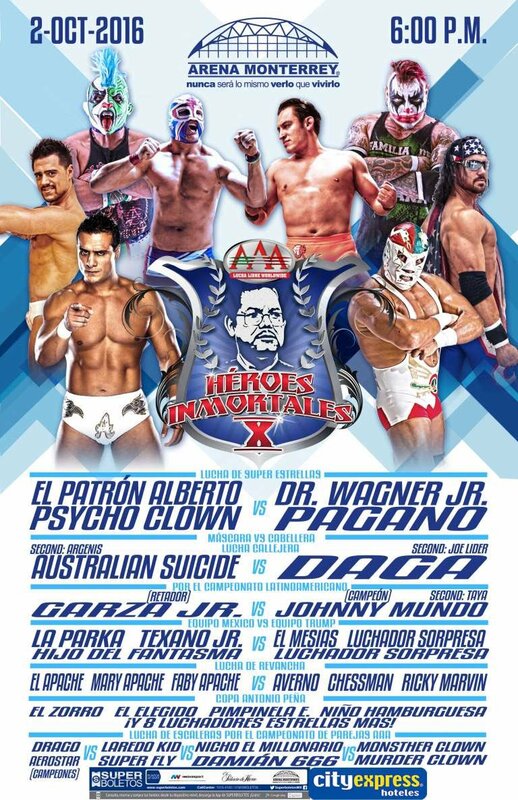 Hijo del Pirata Morgan and Pirata Morgan both returned to AAA as surprised. 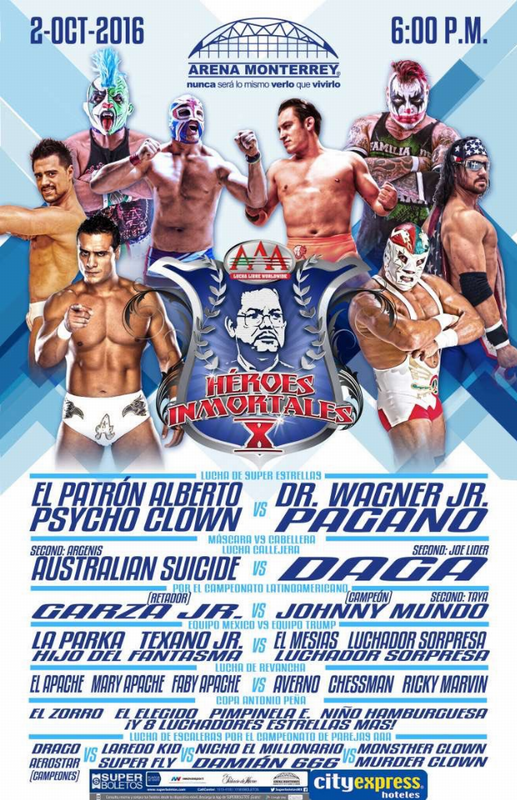 Hijo del Pirata threw out his father. Pimpinela snuck in a foul on Zorro to win. Faby was apparently locked in the dressing room to start the match, ran out to join the math late, and Averno faked a foul from her to draw the DQ. Marty (as Casuas, not Martinez) & Hernandez were surprise Team Trump partners. La Parka appears to have taken the loss. A tribute to Antonio Pena was held after this match. Alberto did not appear, so this was changed to a three way. Psycho Clown was outnumbered 2 to 1. Murder & Monster ran out to help out, but instead betrayed Psycho Clown and allied with Pagano, apparently ending the Psycho Circus. Wagner beat Psycho Clown. Argenis & Joe Lider were seconds. Daga defeated Suicide, who was announced as Broderick Shepherd, from Melbourne, Australia. Taya seconded Johnny Mundo, TV host Ernesto Chavana seconded Garza. Moved to the main event. Taya snuck in a foul, which Garza blamed on a Chavana distraction. First defense.